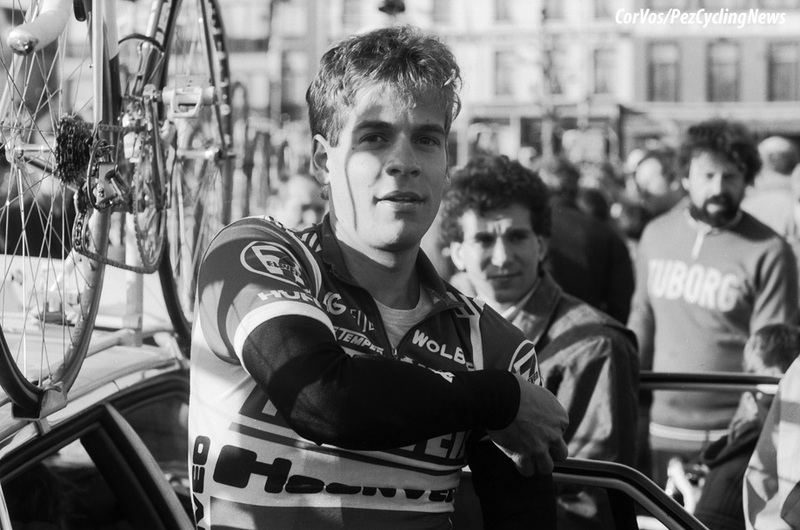 Past Champ Interview: One of the most inspirational riders from the US in the 80s and early 90s was Andy Hampsten. The man from Ohio quietly got on with building his career, going his own way and stacking up the big wins. Giro winner, Grand Tour stage victories, Romandie, Suisse and Galicia wins... The list goes on. 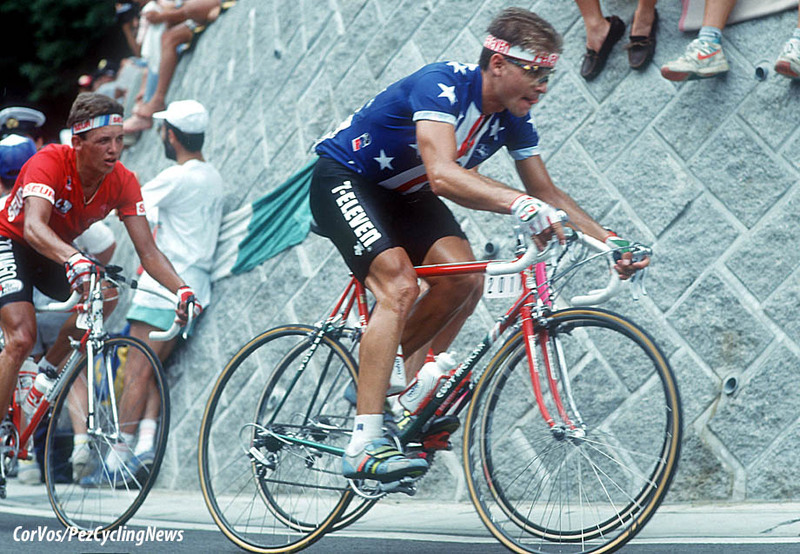 Ed Hood gets the full story in this Andy Hampsten interview. 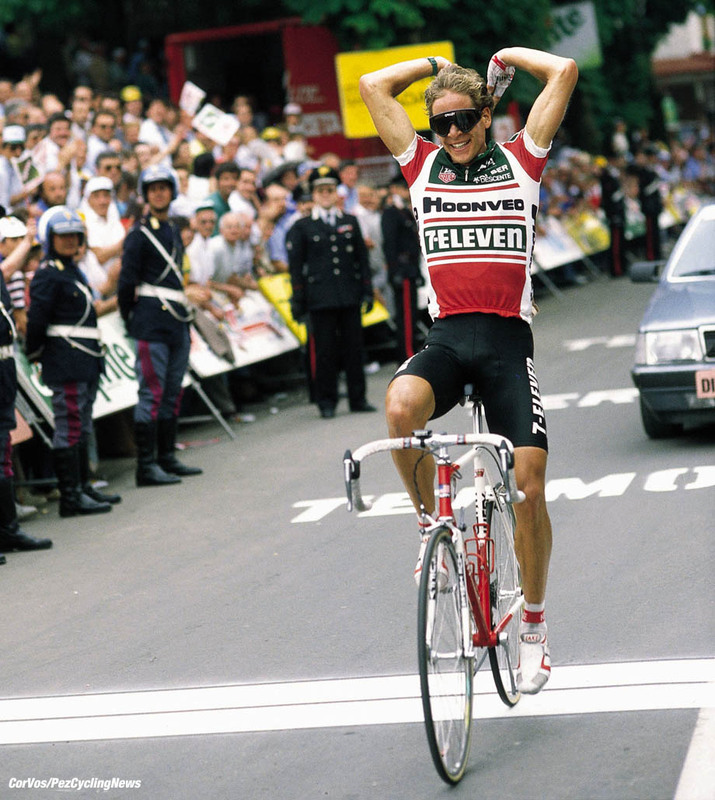 Andy Hampsten; the slim North American’s name is synonymous with three great Cycling deeds; taking the maglia rosa on ‘that’ snowy stage in the 1988 Giro; then going on to win the race overall - and his magnificent Alpe d’Huez stage win in the Tour de France in 1992. But there’s much more to the man than just those three historic achievements; PEZ caught up with him to discuss the other high – and low – spots in his career, not forgetting those glory days of ’88 and ’92. PEZ: You were something of a team time trial specialist in your young days, with two Junior Worlds medals to your name. 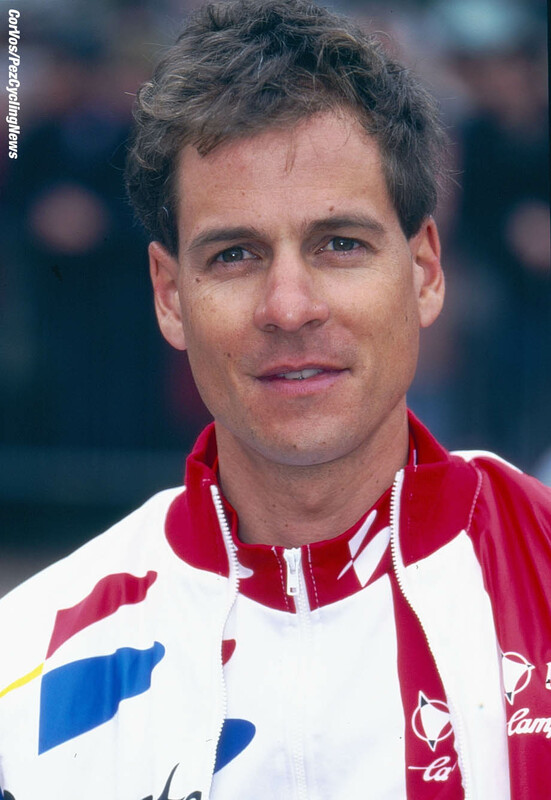 Andy Hampsten: Back then the junior national coach was Eddie B – Borysewicz – who came from Poland and in Eastern Europe, the school of thought was that the TTT was the event to win so we did a lot of TT and TTT training. The race distance was 75 kilometers in those days; we were third in Argentina in 1979 behind Russia, Greg Lemond was in that team, then second in Mexico in 1980, again with Russia as winners. 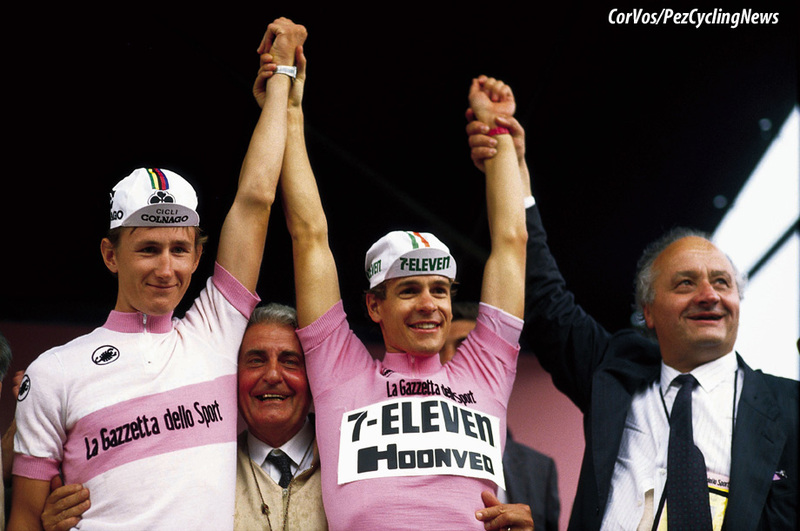 PEZ: Fast forward to 1985 and you won a Giro stage for 7-Eleven when on a one month contract? Yeah, I was riding for Levis in the States and I got a one month contract to ride the Giro with 7-eleven, you could do that kind of thing back then. That win got me a lot of attention and I remember Greg Lemond saying to me that I had to get out of US racing and race in Europe. PEZ: And there was a nice win in Colombia too, that year? Yes, the ‘Gran Caracoal de Montana’ a series of four races for climbers – I won one and the overall. If you scored highly in the points classification of the Vuelta, Giro and Tour you got an invite. I got an invite after my Giro ride; they added the mountain points you won in the Grand Tour to the points you accrued in Colombia and I ran out overall winner. PEZ: And there was a win the Memorial Nencini mountain TT in Italy ahead of Lejaretta and Saronni - quality guys. When I went back to Italy with 7-eleven to the Worlds at Montello we were looking for races to ride to prepare and I got an invite; it was fun to win that one. 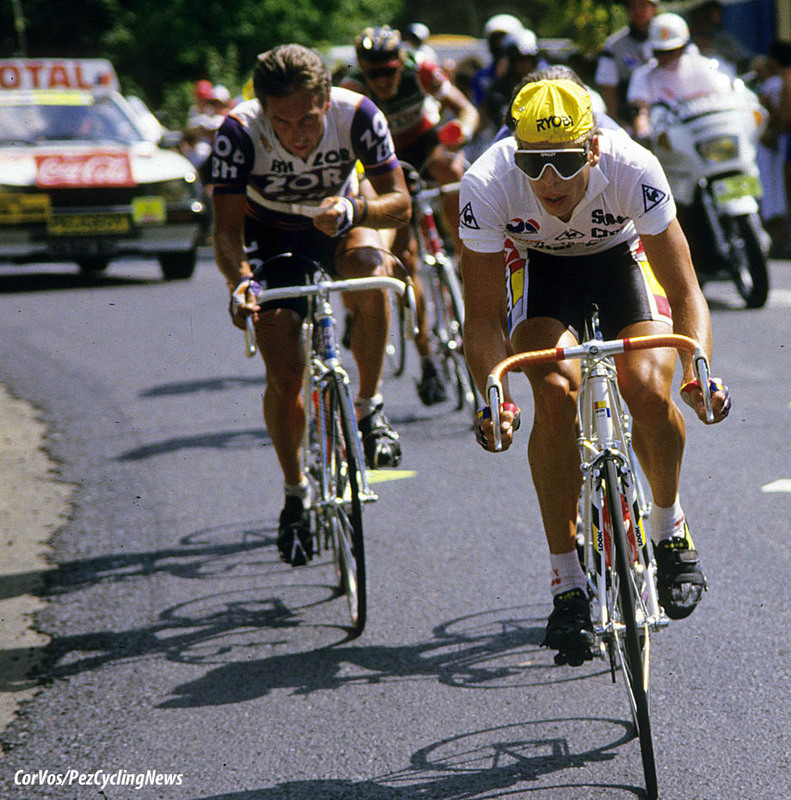 PEZ: La Vie Claire in ’86; Lemond, Hinault, Bernard Tapie at the helm. Yes, fantastic, a ‘dream team.’ My first year there was very good with a win in the Swiss Tour, fourth and best young rider in the Tour de France. 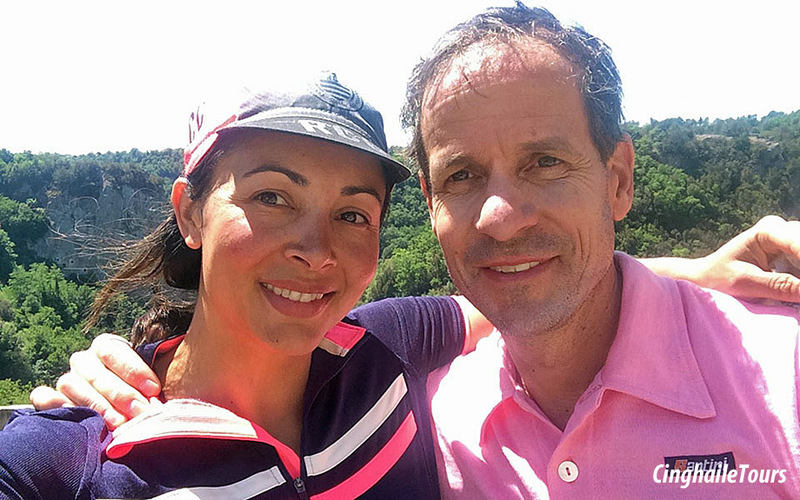 I’d moved to Switzerland to be close to our coach, Paul Koechli. Early results weren’t important, I was riding the Tour of Baja in Mexico in the spring then I rode the Dauphine; it was cold in Europe and whilst I got third on a stage it wasn’t certain that I’d ride the Tour de France. I had some really good team mates for the Suisse Tour, Guido Winterberg and Nikki Ruttimann. I was in the hotel with them the night before the prologue; I always got very nervous before big races and I never touched a drop of alcohol during the season – but they persuaded me to have a shandy [beer & lemonade, ed.] and that relaxed me. I was off early in the prologue and posted fastest time but thought nothing of it because there were a hundred guys still to ride. I pedaled back to the hotel had a shower, looked at the TV and I was still leading, I thought; ‘well, Greg and Bernard are still to come so they’ll beat me.’ I was drying my hair as I watched Greg finish but he didn’t best my time and I thought – ‘Bernard is bound to beat me.’ But he didn’t and I had to jump back on my bike and pedal back to the finish for the podium ceremony. I would say though that I had huge help from Bernard to win the GC in that race – but that was me into the Tour team. 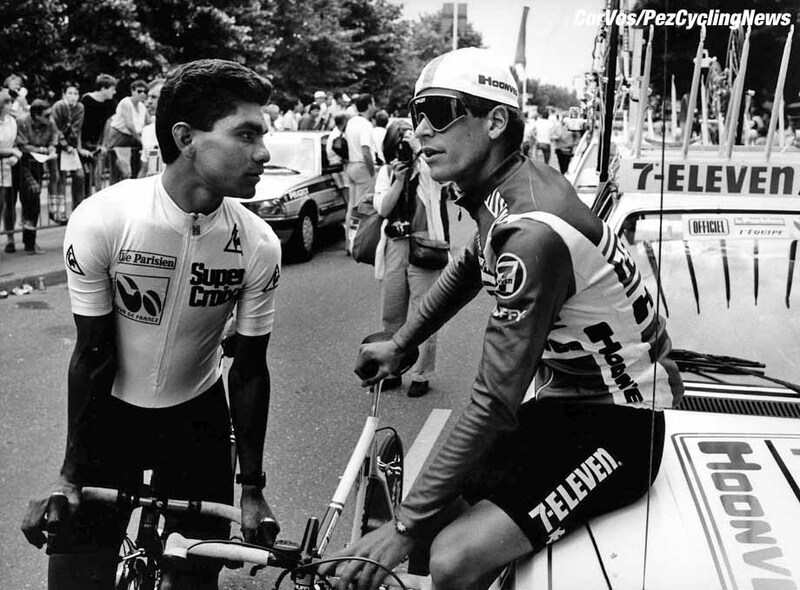 PEZ: And you were best young rider in the ’86 Tour amid the civil war in the team. Yeah, that was quite an experience – and great for the roadside fans of course. 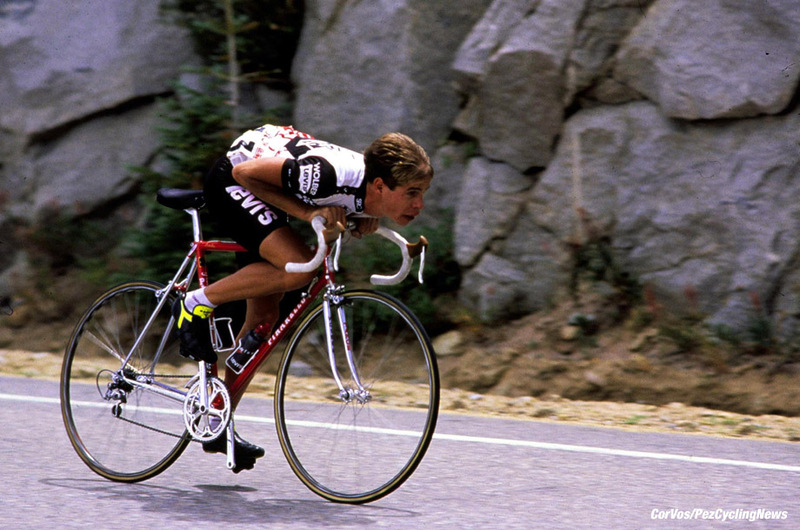 Hinault was the leader but he was supposed to help Greg win; we were naïve and thought he’d honor that arrangement – but he attacked and took five minutes out of Greg. It was a very tense situation but a great experience. [Lemond ran out eventual winner with Hinault claiming that he’d only made things difficult for the American so that his win would be ‘well earned’ ed.] I was really a domestique as I was third in the pecking order behind Greg and Hinault but I was going very well in the last days of the race and finished fourth overall and best young rider. PEZ: You left the team after just one year to go to 7-eleven, which became Motorola – why jump ship? Paul Koechli left the team to start his own Weinmann team and Jean Francois Bernard was the new ‘white hope’ on the team – it all got very tense. The 7-eleven team made me a good offer and they had a DS I believed in, Mike Neel. 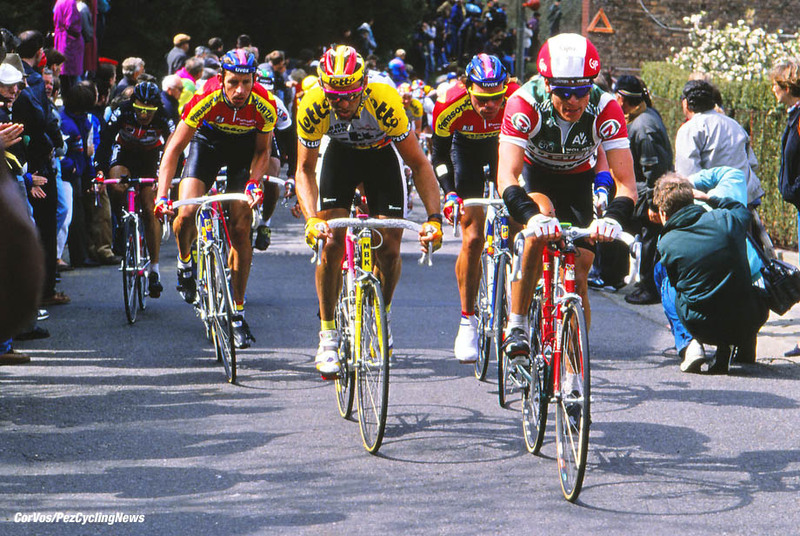 The team evolved, initially we weren’t really training seriously enough but we recruited guys like Dag-Otto Lauritzen and Sean Yates who really showed us how the work should be done. Sean was an experience professional and told us how things were going to go. We were just cowboys at that stage, I guess. PEZ: But you still won the Tour of Switzerland again in 1987? We had a rough start, it was the US Nationals the week before and we were all a bit jet lagged. Suisse can be a bit chaotic, it’s a serious race and we decided that after the first few stages we should really focus and do better in the stages to come. 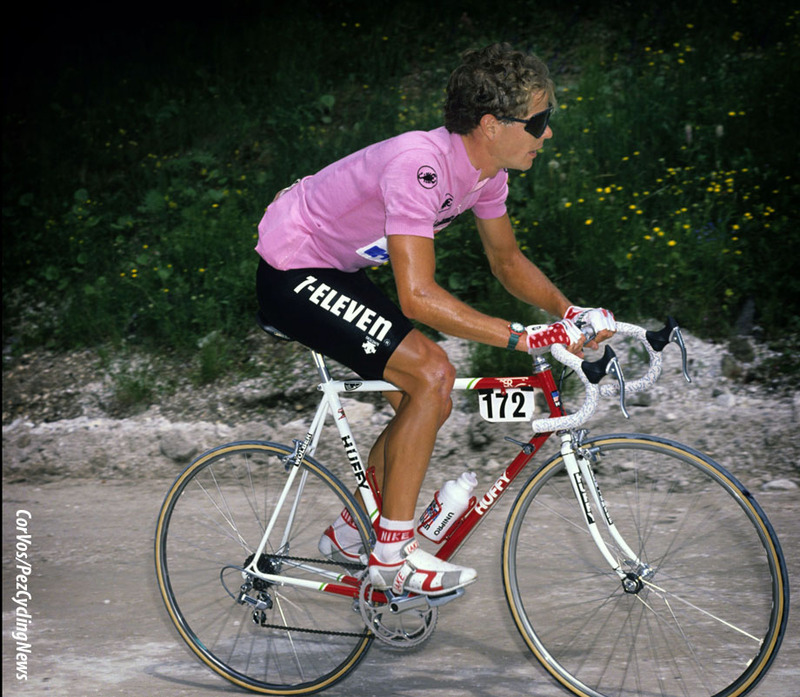 PEZ: And ‘88 wasn’t just about the Giro, was it – there was the Mont Faron stage in Paris-Nice too? That Mont Faron win was the earliest big win I ever had; I always contracted bronchitis after our Belgian campaign. Then I’d do Romandie and Suisse; we had Raul Alcala riding well too, he won a stage in Trentino so there was a great atmosphere on the team as we went into the Giro with two leaders, hunting for results. I was second on a stage a few days before the Gavia stage then I won a stage, looking back, I was flying – then I won the mountain time trial after I took the jersey. I had been waiting for the Gavia stage, I don’t think it had been raced for 30 years. I was friends with the former Giro winner and Italian legend, Gianni Motta and he told me; "you can win this Giro on the Gavia, they say it was a tough climb in the 60’s but in modern cycling it’s 'just another climb' but they have no idea how hard it really that stage is." I put everything into that stage and really suffered. But we were prepared, our management knew what to expect – it would be snowing but not icy and the pass would be kept open with snow ploughs. The team went into the local ski shops and bought anything that looked warm I was wearing neoprene gloves. Every rider had a musette full of cosy stuff; which they put on one kilometer from the summit – most teams just had a ‘rain bag’ for each rider but usually that just contained a plastic rain jacket and the riders themselves decided what else. We were better prepared. 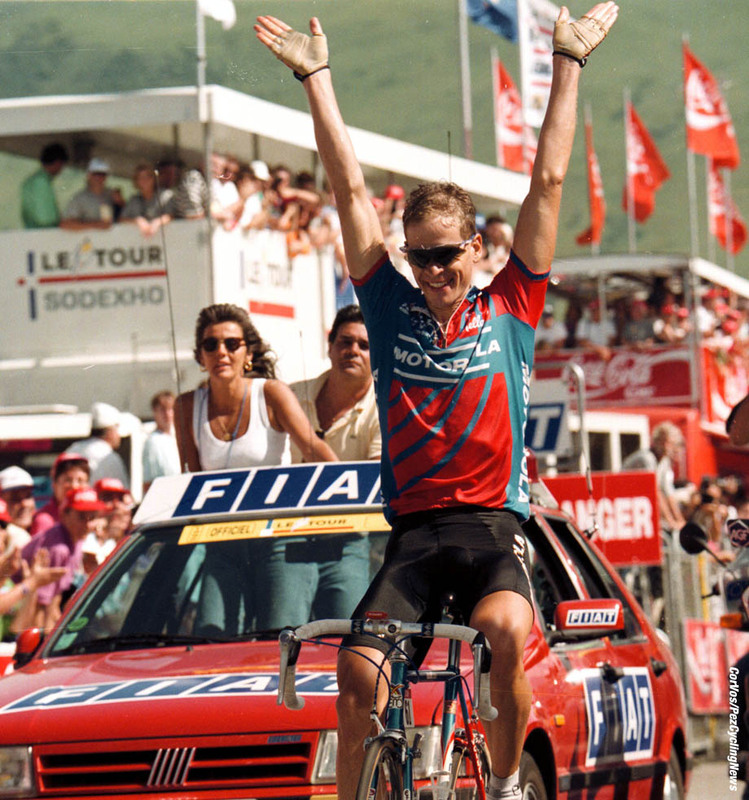 [Hampsten finished second on the stage behind Erik Breukinck to take pink, which he would defend to the end. ed.] At the finish I was in a state of rage and shock, shaking like a kitten, it took a long time to warm up in the team car which was parked 50 meters after the line. I had a moment to cry, calm down and warm up – I was upset because no one was telling me what was happening; Breukinck had won the stage and I was seven seconds back on him but what was the overall situation? It was five minutes before the Chioccoli in the pink jersey came in and I was race leader. It was a dream – then my team mates started to come in and heard that I was in pink. . .
PEZ: And you won the ‘cult’ Subida Urkiola mega hilly race at Durango in the Basque Country twice? Yes, it used to be the day after the San Sebastian Classic describing a big loop over a lot of hills. It wasn’t what you’d call a ‘controlled’ race, the field just whittles away until there are only a few left. It was a big race for the Basque fans, they’re so knowledgeable about the sport – they know everything about everybody! 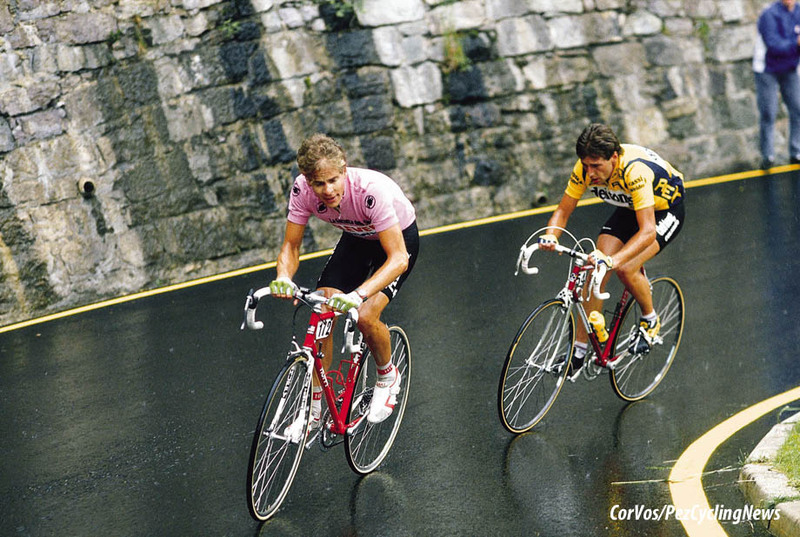 PEZ: There was a Giro podium in ’89 too. 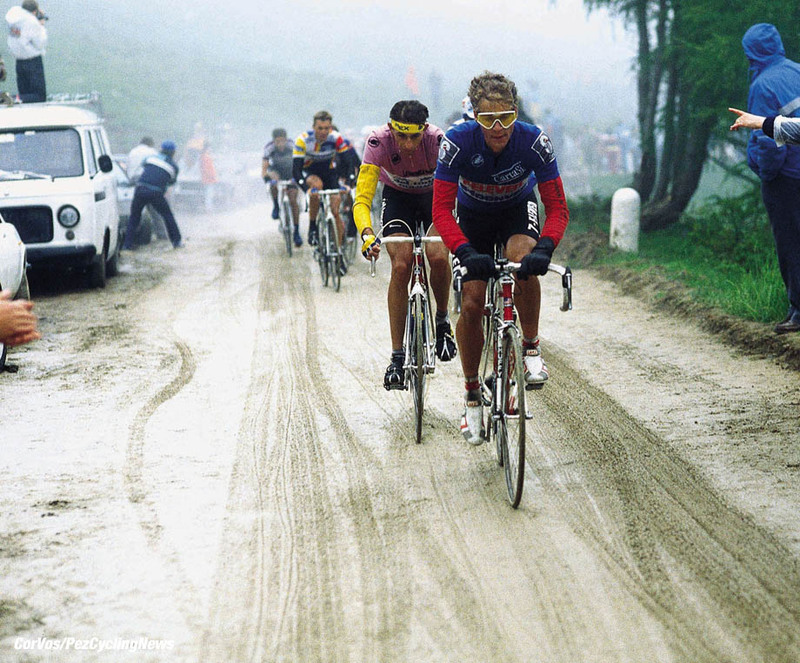 Yes, I was third but circumstances were stacked against me with one of the big mountain stages cancelled – some sort of political payback around Moser, Fignon and Giupponi. PEZ: Your palmarès seemed to ‘drop off’ a little in ‘90/’91? 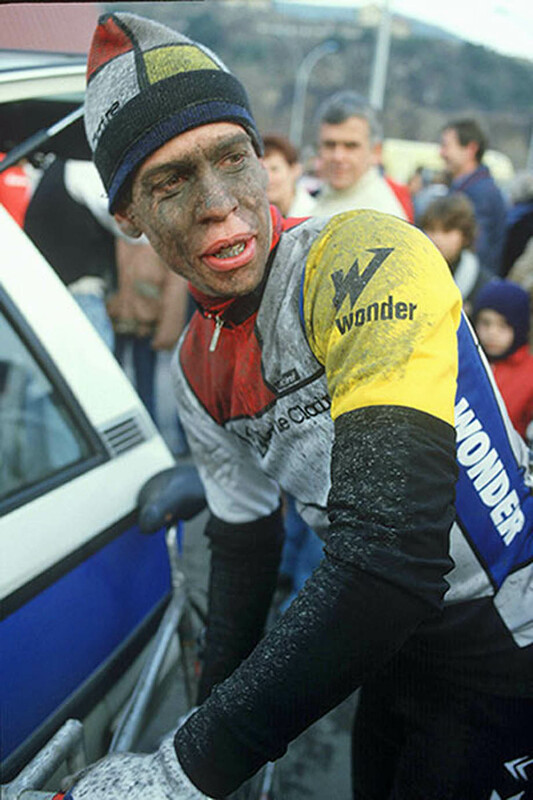 PEZ: Season 1992 wasn’t just about L’Alpe, you won Romandie overall too. Romandie was my ‘home’ race, I won the Queen Stage, solo that year; the team were very good at leading me into climbs and setting things up for me. I also rode well in the flat time trial in my home village, Indurain won that one from Bortolami and Mottet – I always got nervous before time trials but when the flag dropped I just decided to have fun that day. I’d never won a Tour stage and decided it was time to win one. The break went on the Croix Fer, which was a little earlier than I’d have liked but I didn’t want it to come down to some big drag race on L’Alpe. I was careful to keep eating and drinking and Eddy Merckx, who sponsored us that year came up in the car to speak to me. Eddy was great, back in ’89 when the team had food poisoning and I finished back in 80th position, he just said, ‘tomorrow’s another day. . . But that day he said; ‘attack hard with five kilometers to go!’ That’s what I did; but how hard should I go? I still kept eating and drinking and those last kilometers were fun. When you win a stage race it’s more a sense of relief at the end but when you win a stage like that it’s immediate and just so much fun. That was one of the favorite moments of my career. PEZ: ’93 and another win in a ‘cult’ Spanish race, the Tour of Galicia. We had a good young team and on the Queen Stage I got a lot of help from Sean Yates; Noel Dejonckheere our DS had his brother with him and he recce-ed the finale of that stage. There was a small climb then a very tricky decent into the base of the big climb, he said we should attack on that decent. That’s what we did and caught everyone napping – Sean did the damage with me hanging on for grim death. Sometimes you just couldn’t follow him, he was so fast on the descents. 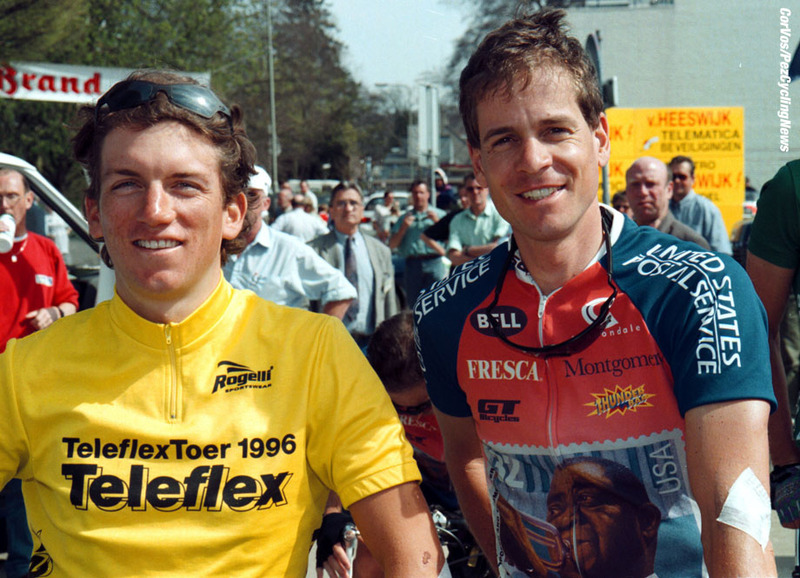 PEZ: Catalonia and Romandie GC podiums in ’94. 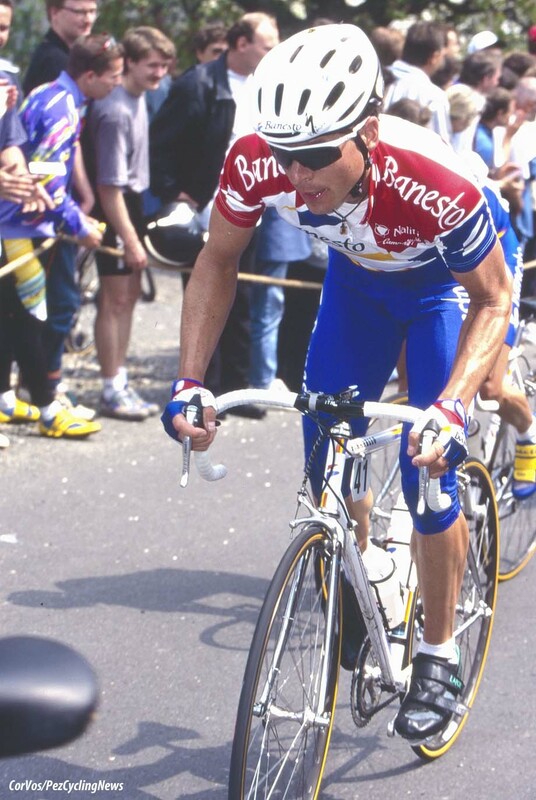 That year we had Alvaro Mejia as joint leader, a very talented Colombian, he was fourth in the Tour de France in ’93 and won the Route du Sud in ’94. I didn’t ride the Tour in ’94. PEZ: You left Motorola to go to Banesto for season ’95 – why? At Motorola we’d always ridden for whoever was going best but things were leaning towards, ‘all for Lance’ and I didn’t like the shifts I was seeing. By that time I’d accepted I was never going to win the Tour and decided to move. Miguel and Prudencio Indurain were great guys and if Miguel was on the race you were riding then things were unbelievably well organized. But if he wasn’t then it was ‘hands off’ management and very poor. That was a disappointing year – I remember we were riding a stage which finished in Segovia, that’s Pedro Delgado’s home, he was retired by then and he came to visit my room mate. We were chatting and I remember him saying; ‘the team’s not what you would imagine, is it?’ But it was good to try it; that experience was why I went to the small US Postal team for my last year. PEZ: As I Scot, I have to ask, what was Brian Smith like as a team mate? Brian, yeah, it’s fun to see him on Eurosport. He was very, very dedicated, he wanted to learn, he used to get excited and nervous before races – he really like chaos in races, when you didn’t know what was going to happen next. He was a good team mate and that aspect of racing, the unknown, really thrilled him. PEZ: Did you achieve all you wanted to? No regrets; I never won the Tour but I won the Giro and saw so many places. With hindsight I wish I’d been a little more relaxed. 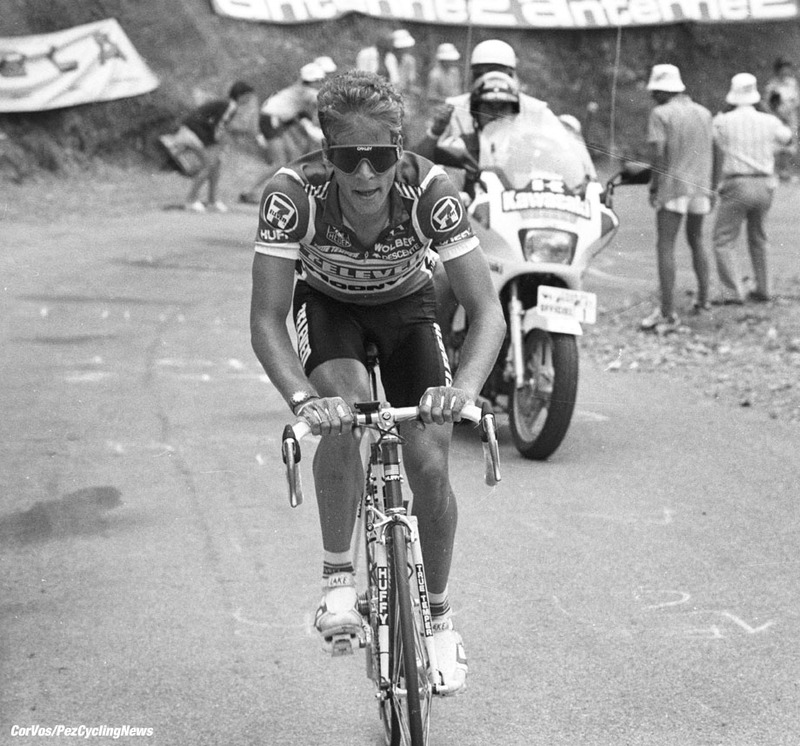 When I was young I was very fast on the climbs, I could get across to breaks very quickly. But you have to work on your stamina and time trialling to be a stage race rider and I lost that speed. When I look back, Max Testa was very good at guiding me but whilst I was good up to five hours, the six, seven hour races didn’t suit me. And I would say I always put more pressure on myself than the team ever did. PEZ: And life these days? I split my time between Colorado and Italy; I do my bike tours in the spring and fall in Italy, over the Gavia if the weather is nice and we ride in Tuscany and the south – beautiful countryside. And at home in Colorado I do a lot of skiing. It’s good for my kids to experience the different cultures. . .